Bjarni Jónsson, Vanderbilt’s first distinguished professor of mathematics, was born on February 15, 1920, in Draghals, Iceland. He received his bachelor’s degree from the University of California at Berkeley in 1943. He earned his Ph.D. from the same institution just three years later in 1946, under the supervision of the famous mathematician and logician Alfred Tarski. 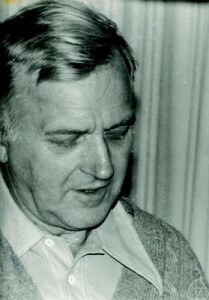 Jónsson then taught at Brown University from 1946 to 1956 and at the University of Minnesota from 1956 to 1966. He was hired by Vanderbilt University in 1966 as the Department of Mathematics first distinguished professor and taught here until his retirement in 1993. Jónsson is internationally recognized for his contributions to the fields of lattice theory and universal algebra. His first publication, a monograph co-authored with Tarski, dealt with direct decompositions of algebraic systems, a topic to which he returned in several subsequent publications. His work in universal algebra also included major discoveries in the theory of varieties, among them a fundamental characterization of congruence distributivity and a frequently cited result known as Jónsson’s Lemma. His research in lattice theory dealt extensively with modular and Arguesian lattices, sublattices of a free lattice, and varieties of lattices. His later efforts focused on the theory of relational algebras. The importance of his work is reflected by the fact that a number of mathematical objects and concepts are named for him, including Jonsson and Jonsson-Tarski algebras, Jónsson cardinals, Jónsson terms, the Jónsson-Tarski duality, and ω-Jónsson functions. During his career, Jónsson authored 89 research papers and served on the editorial board of several mathematics journals. He was the honorary editor in chief of Algebra Universalis. He presented numerous invited talks at mathematics conferences around the world. In 1974, he was an invited speaker at the International Congress of Mathematicians, one of the most significant recognitions of a mathematician’s achievements. In 2012 he was elected an inaugural fellow of the American Mathematical Society. He was the recipient of Vanderbilt’s Harvie Branscomb Distinguished Professor Award in 1974, and the Earl Sutherland Prize for Achievement in Research in 1982. He also received an honorary degree from the University of Iceland. When Jónsson came to Vanderbilt in 1966, the Department of Mathematics was primarily an undergraduate instructional department. Jónsson was instrumental in establishing the department’s graduate program, which presently ranks among the top departments in the nation according to the latest evaluation by the National Research Council. In 1995, the department established The Bjarni Jónsson Prize for Research in recognition of his contributions. The prize is awarded each year to a graduate teaching assistant for exceptional research accomplishments and outstanding research potential. Jonsson also established and developed an algebra research group at Vanderbilt that continues to attract mathematicians from this country and abroad. Through his research and his influence on the research of colleagues and graduate students, he contributed greatly to the high research profile the department currently enjoys. Bjarni Jónsson continues to inspire a great deal of traveling along the intricate paths of mathematics. His work will have a lasting legacy. Additional biographical information about Bjarni Jónsson, including links to his publications, is available here.